Lucky Oscar always gets free ice cream! The real question is... strawberry or vanilla?? Super cute! 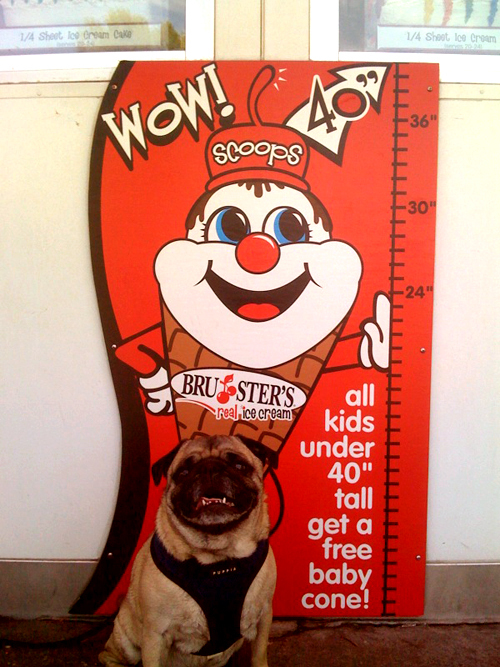 "He" tried sitting in front of the sign at Bruster's, but it didn't work for him. (They love Bruster's). Lucky Oscar, indeed! Oddly enough, my questions is about Oscar's harness. I noticed it's the Puppia harness. I ordered one about a year ago for my Minpin (size small) but it was too small. i just ordered him another one (size Medium) but I'm worried that it might not fit again! What size is Oscar wearing? Phatchik - I think Oscar's Puppia is a large.